Don't forget to enter my necklace giveaway. I bought the whole box a few years ago at an estate sale. Think it was about $5 for the lot. Wouldn't it be great if I knew how to sew?! Oh, gosh, this brings back memories. I used to make all my clothes in high school. It was so much fun to choose the pattern and the fabric. I love the illustrations on the front of the patterns! They always look like mock-ups for Vogue! Much more elegant than the way they are done today! Should the need ever arise -I can follow a pattern pretty well - made my own dress one year for something in high school. But, I marvel at those whom are more of the professional persuasion! Understanding fabrics and bias and stitching styles......Wow! And J, I an confident that you could do it without much effort. I can't sew but I really really wish I could. I would love to make clothes for Abby. I love vintage patterns too. I can do basic sewing. My mom however, that was part of her major in college :). And you find the best deals, seriously! 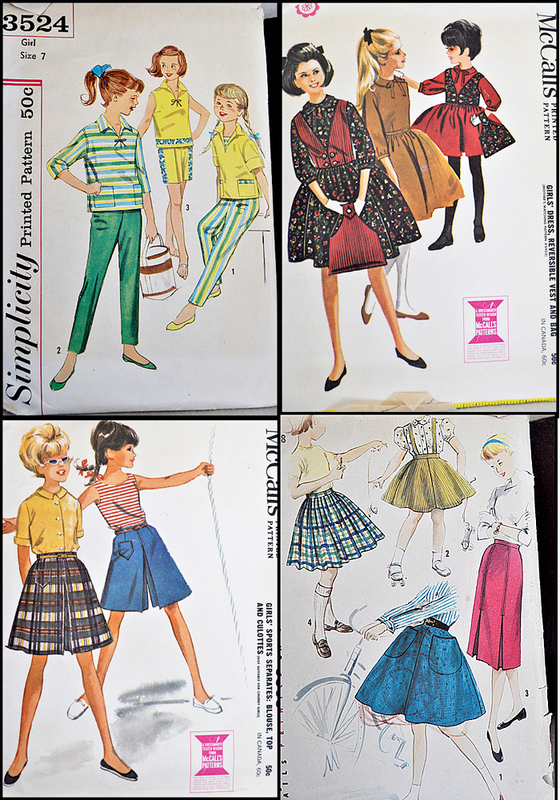 Oh gosh, I can't sew to save my life, but adore looking at vintage patterns too - something about seeing what the gals back then wore...:) And just too too amazing you found that entire box - what treasure! (I love how you framed the ones in your daughter's room). Btw, I can *finally* follow you now!! (Thanks to the computer doctor :)). Don't worry - you don't need to know how with a pattern, just go for it! oh my I love the skirts and the long dresses! great finds! Sewing is not hard, you should give it a go! Yes, I can sew. Years ago I sewed and sewed!!! I have a Singer machine including all of the attachments, I bought it in the '70's from a friend of a friend, it was 25 years old then! I made clothes for myself and J, Halloween costumes, drapes, pillow covers, bathroom swags, bed skirts and even re-upholstered couch cushions. My machine sits in a closet and I use it once in a while to repair something but I have retired from dressmaking etc. Wow these are so fun! haha, jeanette, it's those small details we overlook. I think they will be beautiful framed. Those tunic patterns are so swanky!! I can do buttons! Does that count? I use the old patterns as tissue to wrap packages, etc. well, i have a lot of mending planned to do today. i did make an apron for my daughter to wear as alice in wonderland. wish i could REALLY sew professionally like my aunt! she is amazing. my mom is pretty darn good, too. glad my mom forced me to learn what little i do know. Oh i love this... reminds me of my mum... she has a room full of vintage pattens! Your last but one line made me laugh out loud! I too am seduced by old things like patterns - love the idea of framing some of them on the wall of my sewing room. I WISH I knew how to sew. It's on my endless to do list. HA! Hello! whew...22comments what a popular girl you are becoming! I love old patterns too. You could take a sewing class at the local college or whatever...Just like in the days when these patterns were new. I have some of my “original” patterns...peaseant blouse pattern that I thought I was being so creative with by making it longer for a “granny dress” or raising the waist for “empire style”. Not alot of clothes choices or money back in the day. I still have a cute Betsy Johnson pattern. she was my idol. all the best to you...weather getting cooler? we have 94 degrees today....Yikes! You are SO funny Jeanette! Where do you put all of your Incredible vintage finds? Are you one of those people who can make something look like it always belonged in your houwpse, and your house never looks crowded? My sister is like that ... I'd love a peek at your home! Oh this takes me back to the horrors of school needlework.The sewing machine used to terrify me,still does actually . Although now i can sew by hand very well. OMG, I remember sewing from these patterns in the 70's. Boy do they bring back the memories!